BRAMPTON, ON – Hop City Brewing, the Ontario-based craft brewing division of Moosehead Breweries, has announced the release of a new seasonal beer, as well as a new look for its full brand line-up. The new release for spring is Payday Saison, a 6.1% abv and 40 IBU unfiltered saison brewed with Magnum, Styrian and Strisselspalt hops, as well as coriander and grains of paradise. 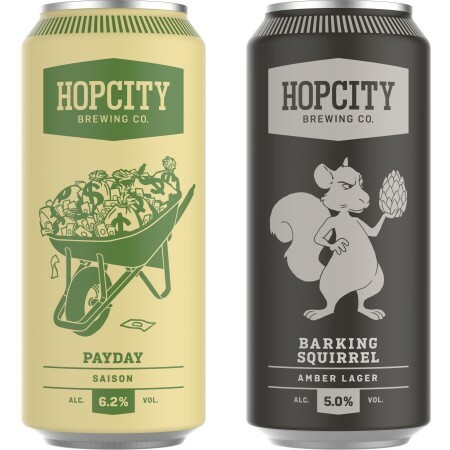 Payday Saison is launching soon at LCBO locations in Ontario, and features a clean and striking new packaging style that will also be adopted for Hop City’s year round brands, including Barking Squirrel Amber Lager, Hop Bot IPA, 8th Sin Black Lager, Lawn Chair Weisse, and Polly Wants a Pilsner. More details will be available on the soon to be relaunched Hop City website.